At this article studies of nonlinear viscoelastic fluid with one internal tensor parameter flow between parallel planes under a constant pressure gradient, taking into account the slipping phenomenon on the boundary. Numerically depending found on the components of the stress tensor and the flow velocity of the pressure gradient and the distance to the wall, enabled us to explain the emergence of non-parabolic profile of the flow velocity of the polymeric melt. Many fluid systems, including polymeric materials, reveal the anomaly of slipping often near the solid surface. The presence of such a wall effect leads to a violation of the hypothesis on attachment and the need to specify appropriate boundary conditions. This anomalous behavior of materials in a plastic state (slurry, grease, fluids and polymer melts) at solid surfaces requires a comprehensive study of both rheological properties and calculating the flow parameters and characteristics of the processing equipment. In the first place, there are rather complex problems of determining the rheological characteristics of the material results according to the viscometric studies. The next stage is associated with specific problems on the motion of fluids which exhibit abnormalities in solid surfaces and the direct use the sliding velocities as boundary conditions. It should be noted that the study of this issue is reviewed in a large number of papers in , where it was noted that there are two approaches to study of this phenomenon. The first approach is a detailed study and consideration of molecular properties of contacting media, the formulation of a mechanism of slippage and checking the adequacy of the proposed approach. Moreover, the results for different physical systems have much in common, which indicates the possibility of a unified approach to the study of this effect. 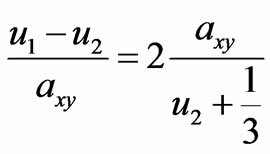 The second approach is to specify explicitly the slip velocity at the wall – , which is generally a function of stress at the wall – , the geometric dimensions and temperature. And this dependence of slip velocity at the wall of these factors can be found from viscometric measurements . From the mathematical point of view, the result of each approach leads to dependence – , and this dependence is taken from the processed experimental data. At the same time as an argument, you can choose not only – , but the pressure gradient and the specific consumption and the choice of a particular function in the study depending on how easily one can apply the law in the calculations. where —the stress tensor; p—hydrostatic pressure, and —the initial values of the shear viscosity and relaxation time, —the tensor of velocity gradients; —symmetric second rank anisotropy tensor; —the first invariant of the anisotropy tensor, —the symmetrized velocity gradient tensor, —phenomenological model parameters that take into account in the equations of the dynamics of the macromolecule size and shape of the molecular coil. 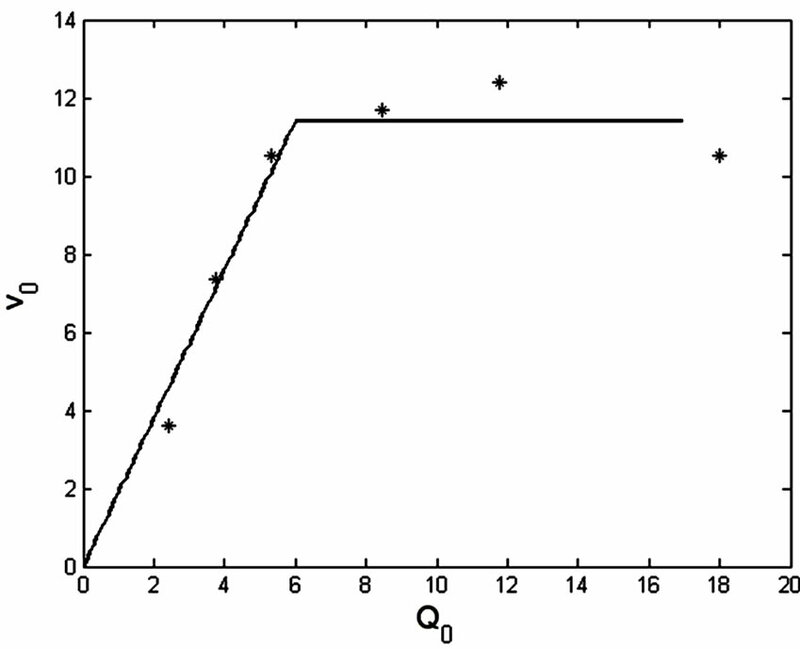 This model was tested for compliance by viscosimetric flow of real polymeric liquids [2-7] and by calculating the overlap of small oscillatory fluctuations in simple shear flow in the parallel and orthogonal shear directions . In conducting the numerical experiment dependences on the stress tensor of velocity gradients and from time to time were obtained, allowing for calculations of the complex shear modulus, dynamic viscosity and dynamic loss angle depending on the frequency of forcing oscillations, shear rate and the number of Deborah (De). The dependences obtained are compared with experimental data that showed qualitative compliance between theory and experiment. Also on the basis of the rheological model (1) seconddary flows in rectangular channels were calculated. Paper  considered the steady flow in a smooth round pipe under constant pressure gradient. The system of equations for solving the complete hydrodynamic problem was recorded in a cylindrical coordinate system. 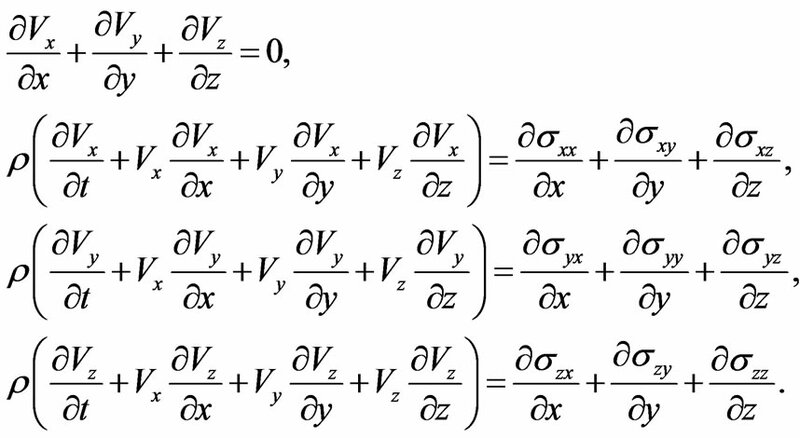 In this paper we will solve the problem of determining the velocity profile of a nonlinear viscoelastic fluid moving between parallel planes under a constant pressure gradient: , based on model (1). We arrange the origin of one of these planes, axis directed along the flow, axis —perpendicular to the plane and axis —perpendicular to axes and . where: , , —velocity along the axes , and respectively, —the density. 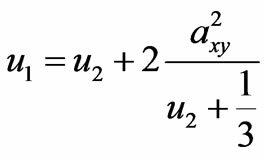 Equation (12) can be solved by one of the iterative methods, such as the method of successive approximations, and taking into account the expression (6), we can find the dependence: that is, by virtue of (11) and (10) leads to dependence and. Next numerically integrating, using (7) and using the boundary condition the dependence can be found. where —the additional flow rate calculated under the condition at the wall sticking. If we assume that is a function of —the stress at the wall, when calculating the velocity profile becomes necessary in an iterative procedure for approval and . Values themselves were determined by the formula: . Note that the data for low density polyethylene have been described based on the approach (1) in . Figure 1. Approximation of experimental dependence of the slipping velocity at the wall on the additional flow rate. Let us now consider how to influence the parameters of the model, and the type of derived dependencies. To this end, fix scale parameters, and (in this case), and will take into account that in many cases, as shown in . 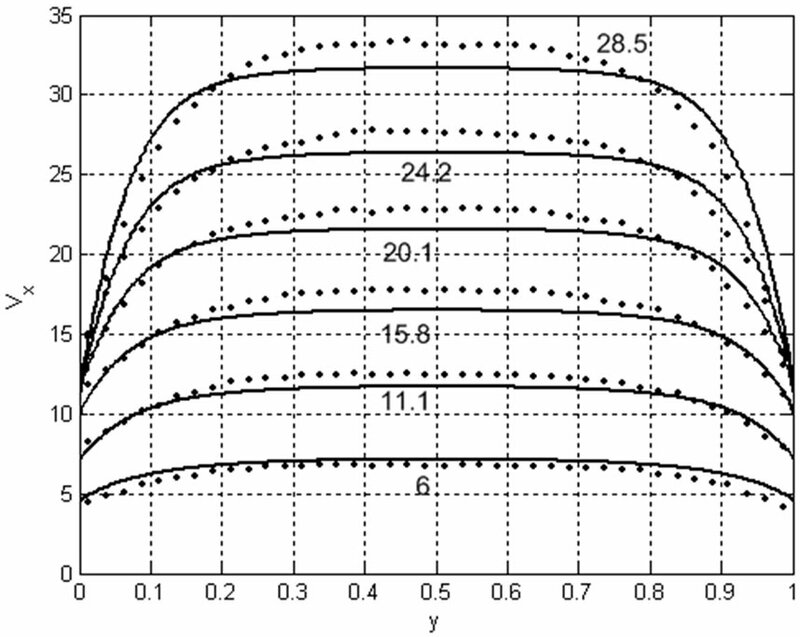 The results are shown in Figure 2, which shows the flow of the pressure gradient for different values and which shows that increases with increasing deviation of the flow from the law of Poiseuille, as appropriate . In this case, the dependences of the accounting slip appears a kink, which is associated with an approximation used for Figure 1. The curves corresponding accounting slip located above the curves are constructed by taking into account the slip at the wall. In order to allow comparison with experimental data , we note that in [9,10] there are no data on the values of the pressure gradient and therefore its definition should be used according to Figure 2 and the known values of flow rate to determine the value of the pressure gradient and then using it to calculate the velocity profiles. Comparison of experimental and theoretical curves for the velocity profile in the gap between the parallel planes are shown in Figure 3. Thus, in considering the case of plane Poiseuille flow with allowance for slippage of the polymer material at the boundary, the system of equations of the modified model Vinogradov and Pokrovskii describes non parabolic velocity profile in the gap between parallel plates, which is confirmed by experimental data. 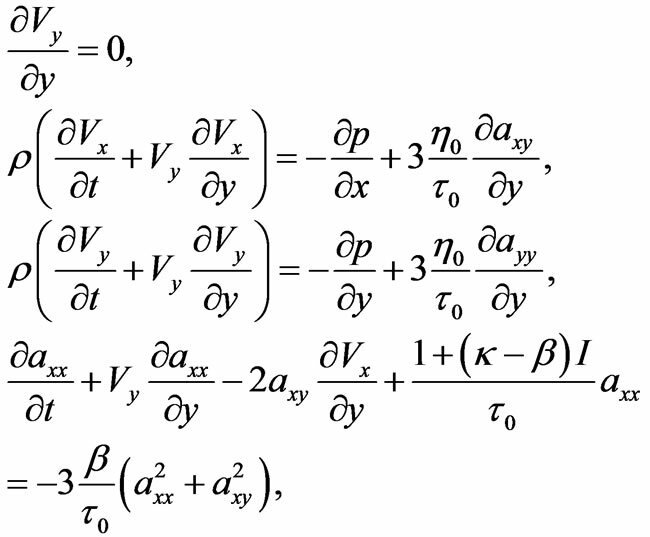 Dependence obtained in this can be used to develop numerical methods for 2-dimensional and 3-dimensional flows as an initial approximation of input and output profiles in the simulation of flows of polymer fluids in the gap between parallel planes, for example, when forming thin films. Figure 2. 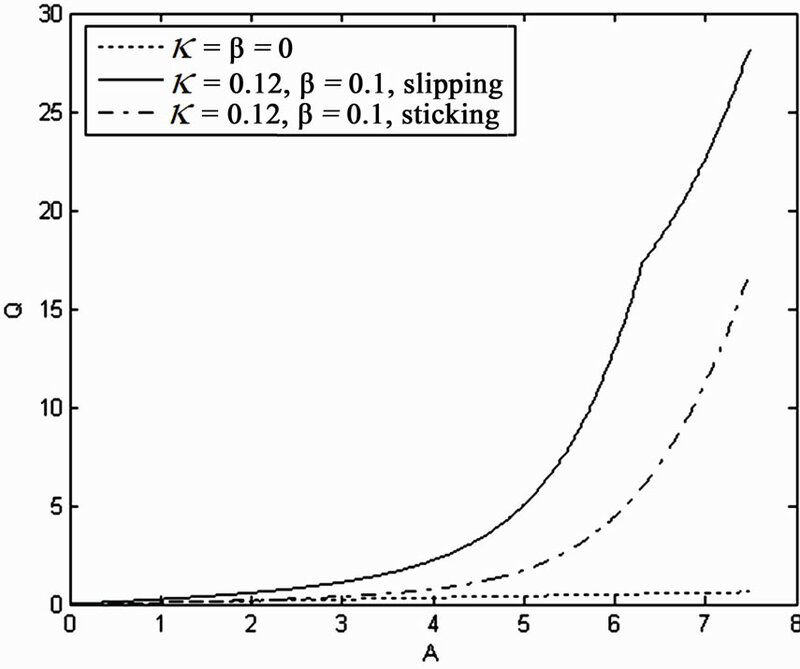 Dependence of flow on the pressure gradient in different flow regimes in the presence of stick and slip phenomena. Figure 3. Comparison of experimental (points) and theoretical dependencies of the velocity profile in the gap for different values of specific consumption. The authors greatly appreciate Prof. Vladimir Pokrovskii for his interest to this work and useful discussions. A. I. Leonov, “A Brief Introduction to the Rheology of Polymeric Fluids,” Coxmoor Publishing Company, Oxford, 2008, p. 257. G. V. Pyshnograi, V. N. Pokrovskii, Yu. G. Yanovskii, Yu. 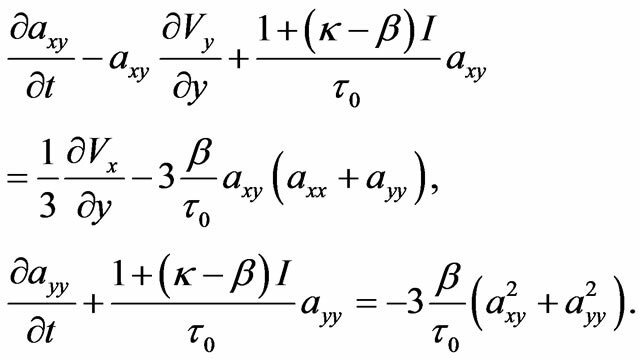 N. Karnet and I. F. Obrazcov, “Equation of State for Nonlinear Viscoelastic (Polymer) Continua in Zero-Approximations by Molecular Theory Parameters and Secuentals for Shearing and Elongational Flows,” Doklady Russian Akademy Nauk, Vol. 335, No. 9, 1994, pp. 612-615. A. S. Gusev, G. V. Pyshnograi and V. N. Pokrovskii, “Constitutive Equations for Weakly Entangled Linear Polymers,” Journal of Non-Newtonian Fluid Mechanics, Vol. 163, No.1-3, 2009, pp. 17-28. 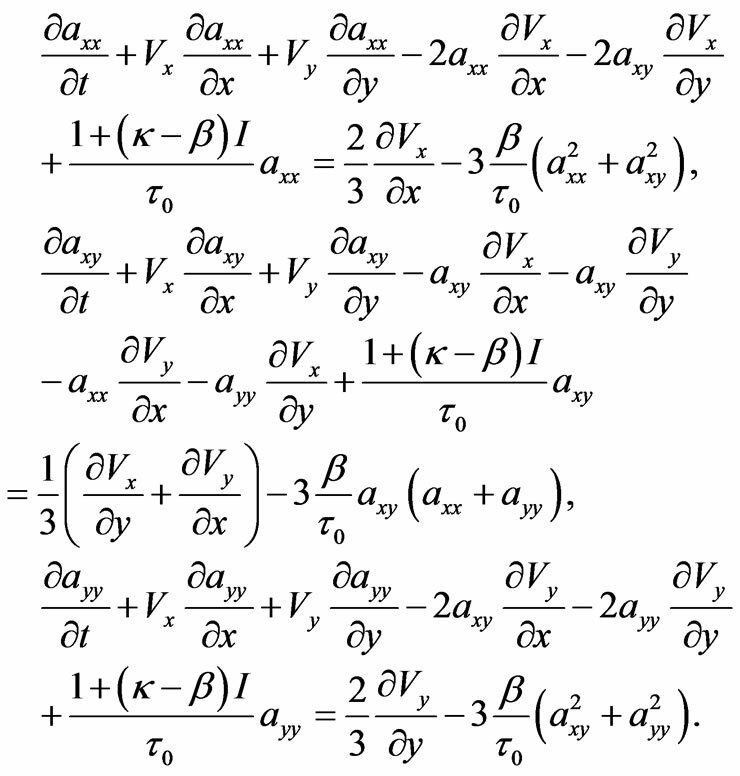 A. Gusev, G. Afonin, I. Tretjakov amd G. Pyshnogray, “The Mesoscopic Constitutive Equation for Polymeric Fluids and Some Examples of Flows,” In: J. N. Perkins and T. M. Lach, Eds., Viscoelasticity: Theories, Types and Models, Nova Publisher, 2011, in print. *This work was supported by the Russian Foundation for Basic Research No. 09-01-00293.